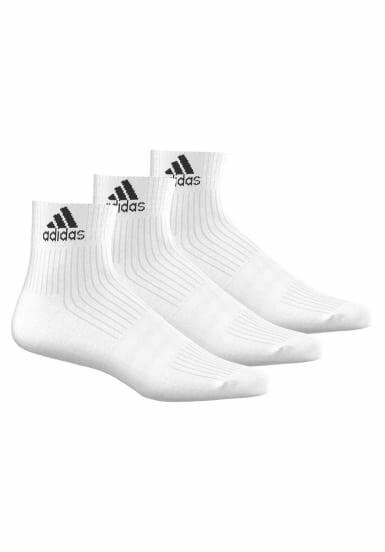 Equip your workout with these ankle-length training socks, which are made with strategic cushioning in high-stress areas. They feature a comfortable build with a bit of stretch. Three pairs per pack Half cushioned for comfort; Anatomically placed cushioning to support and protect high stress areas. Arch support Combed cotton Ribbed construction 62% cotton / 35% polyester / 2% elastane / 1% nylon Machine wash up to 40°, do not tumble dry, do not iron and don't dry-clean! -Half cushioned for comfort; Anatomically placed cushioning to support and protect high stress areas. -Machine wash up to 40°, do not tumble dry, do not iron and don't dry-clean!